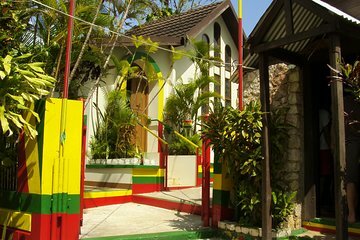 Besök Bob Marleys hem i Nine Mile och de majestätiska Dunns River Falls på denna privata helgedagstur från Ocho Rios, Montego Bay eller Falmouth. Resa till Nine Mile för att se hemma, museum och mausoleum av reggae-stjärnan Bob Marley. Sedan prova läckra jamaicansk mat till lunch (egen kostnad) innan du går till Dunns River Falls för en promenad och dopp i vattenfallet. As soon as we got off the ship, our tour operator Suzette was there on time waiting for us, welcomed us and introduced us to our driver, Warren. He drove us for about an hour all the way to Nine Miles and on our way he talked about the history and culture of Jamaica. We also listened to Bob Marley music which was really cool. He was really friendly and we really enjoyed our ride! The tour in Nine Miles was very interesting and it was worth it. Then, we drove back to Dunn's River falls which was a great experience as we had the chance to walk through the river and climb through the falls. Our driver was always waiting for us and was happy to help us with anything we needed. Generally, it is a really good tour as you get the chance to visit both places in the limited time that you have if you are coming from a cruise ship and it gives you the flexibility to decide how much time to spend on each place, since it was only us two people and the driver. Would highly recommend this tour!